Wondering what electric cars are on the market or soon will be? Wonder no more. I’m going to run down all of them in the article below. I will also add a few key details and commentary for each one (including prices, efficiency, range, and # of seats when such information is available). Furthermore, I’m doing something I don’t think I’ve seen anywhere else — I’m listing all of the electric cars that are available in the US and all of the electric cars that are available in Europe. In the case of electric cars available only in Europe, I’ve tried to find the prices in euros in key markets, in British pounds, and sometimes in other popular markets (like Norway). Note that aside from the vehicles below, there are several electric car models about to hit the market (or seemingly about to hit the market), including the BMW 530e, Citröen e-Mehari, the Kia Optima Plug-In Hybrid, the and of course the Tesla Model 3. The Renault Twizy is a cute and fun little two-seater that comes in at a super affordable price. With just two seats, it’s clearly not a “family car” — and there’s a decent claim that it’s not a car at all — but it is a ton of fun to drive and very adequate for most driving needs. I’d recommend it, but note that it doesn’t have real windows, so it’s perhaps not the best choice for places with crappy climates. Read my full Twizy review here. The Bolloré Bluecar is a low-priced and simple electric car produced and only really available in France. Though, it is also used in the Autolib’ electric carsharing program in Paris, the BlueIndy program in Indianapolis, and the new BlueCalifornia program in Los Angeles, so Bolloré is apparently quite open to fleet deals and, in particular, electric carsharing programs solely using its electric vehicles. It’s not going to thrill most people, but it will get you from A to B — and it’s actually quite snappy at that if its 0–60 MPH time is to be believed. The Mitsubishi i-MiEV (aka Mitsubishi i) is one of the most basic electric cars on the market, but also one of the cheapest. As you may have noticed, the Citröen C-Zero, Peugeot iOn, and Mitsubishi i-MiEV all have essentially the same design. That’s because they’re really the same car underneath the brand logos. None of them sell exceptionally well anywhere, but if you are looking for a bare-bones EV for a low price, the i-MiEV (or one of its identical twins) is your baby. The Citröen C-Zero is produced in France but, as noted above, it was developed in collaboration with Mitsubishi Motors Corporation. Again, it is a twin of the Peugeot iOn and Mitsubishi i-MiEV, basically just with a different brand attached. For whatever reason, I am not a fan of the Citröen logo and much prefer the Peugeot iOn. But really, it’s the same damn car! The smart electric drive is nearly the cheapest electric car on the US market … if you don’t own or lease it for very long. However, note that there’s an $80/month battery rental. Within about 6 years, the smart electric drive is about the same price as a 5-seat and much more plush Nissan LEAF. In my personal opinion, the smart electric drive is a hard sell — unless you really want a tiny car and/or only want it for 2 to 3 years. Read my review of the smart electric drive here or read the review of an owner who sold his Camaro for the smart electric drive. If I were on the market for a car, the Renault Zoe would certainly be in the running. It’s a good-looking, 100%-electric, super-affordable car with great reviews. Renault shocked the EV world at the end of September when it unveiled a long-range Zoe (a 400 kilometer NEDC rating and an admitted 300 kilometer real-world range). This basically made it the first long-range and affordable electric car in the world. The Zoe is routinely the #1 or #2 best-selling electric car in Europe — for several years now. Read my full review of the Renault Zoe here. The Volkswagen e-Golf is VW’s second electric car (following closely behind the Volkswagen e-Up!). Clearly, it’s an electric version of VW’s extremely popular Golf model. The e-Golf has been one of the closest competitors to the world-leading Nissan LEAF, but it has been available in much more limited markets. Additionally, Volkswagen has been much slower to update the battery/range in order to compete with the updated LEAF — not to mention the fresh and exciting Chevy Bolt. A new version of the e-Golf with 124 miles of range is on the way, but it’s hard to see how that will compete now that the Bolt is on the market and the Tesla Model 3 is around the corner. The Nissan LEAF is the highest-selling electric car in history. After test driving dozens of EVs myself, I have to say that the Nissan LEAF is one of my favorite models. It has great visibility, feel, comfort, space, flexibility, and acceleration (okay, 10.2 seconds isn’t spectacular, but it still feels great due to the instant torque). The 107-mile version was the top of the market for affordable electric cars until the Chevy Bolt (approx. twice the range) and updated Renault Zoe came along. Now it’s hard to say where the LEAF stands. Why buy a LEAF over a Bolt? It seems to be getting by on deep discounts and group buys. For a thorough look at the LEAF, check out our long-term Nissan Leaf review here. The Ford Focus Electric is Ford’s only 100% electric car. The car compares in many regards to the top-selling Nissan LEAF, but it also has some disadvantages in terms of cargo space and EV design. The Focus Electric is more broadly available than many compliance cars, but it still isn’t as easy to find as a Nissan LEAF or BMW i3. As with the LEAF, though, it seems that Ford will have to drop prices a great deal to move Focus Electrics off the lot in the age of the Chevy Bolt. Read our in-depth review of the Focus Electric here. The Toyota Prius Prime is a second-gen version of the Toyota Prius Plug-in, which was either the 2nd- or 3rd-best-selling electric car worldwide in 2013. The Prius Prime’s modest 25 miles of all-electric range is a letdown in my book, but the interior space and strong Prius brand sure help to sell this animal. The price is quite attractive, and the fuel economy (MPGe) on electric power is superb. The Prius Prime has about half the range of the Volt, but it does seat 5 people a bit more comfortably … if you need that. One of two cars in Ford’s Energi (plug-in hybrid electric vehicle) lineup, the Ford C-Max Energi has quite good specs for someone who doesn’t drive very far on most days but wants to take very long trips fairly regularly. It’s also good for larger families, as it seats up to 5 people. Despite seating 5, note that it is cheaper than the Chevy Volt … until you factor in the federal tax credit. Actually, the C-Max Energi is quite similar to the Prius Prime in many respects, and almost exactly the same price. I think choosing one over the other mostly comes down to aesthetic/brand preferences. Though, the Prius Prime is considerably more efficient as well. The VW e-up! is an affordable, rather simple electric car but also has some unique braking flexibility and is an adequately comfortable and modern car. I prefer the Leaf, but I think plenty of people might prefer the e-Up! … especially if they are VW fans or want more control over their regenerative braking options. That said, the e-Up! electric range hasn’t been improving as the range of other models has, so it’s no surprise it’s having a hard time finding buyers while Zoe and Leaf sales have grown strong. Read my full VW e-Up! review here. The Fiat 500e has gotten great reviews. However, the head of Fiat apparently hates electric cars and is only producing the 500e in extremely limited quantities for a couple of states (basically, because Fiat has to do so in order to sell cars in California). Hopefully this cute electric car will someday be available to a broader market, and with a significant range boost, but that seems unlikely. With its relatively low price, good reviews, and cool styling, the Fiat 500e could give some of the top-selling electric cars on the market a run for their market if Fiat actually tried — what a shame. Its 84 mile range is a bit behind the times now but Fiat is still moving cars via super-low lease deals in California. Read my full review of the Fiat 500e. The Kia Soul EV is a snazzy electric vehicle with a bit more space on the inside than the average car, and a clear youngster appeal. The Soul EV has sold okay in the markets where it’s available, but it isn’t widely available and the driving range hasn’t increased to respond to increasingly longer range from other electric models. Its overall sales in the US are pretty sad, and I don’t see them getting better unless the vehicle gets a big range boost or Kia starts offering deep discounts. You can check out our review of the Kia Soul EV here. Quite similar to the Ford C-Max Energi but with a few more bells & whistles, the Ford Fusion Energi has done quite well since its introduction in February 2013. The Ford Fusion Energi certainly offers some competition to its sister, the C-Max Energi, as well as the Chevy Volt and Toyota Prius PHEV/Prime. Importantly, for some people, the Fusion Energi is larger than all three of these competitors. It has a bit less electric range than the Volt, but it has enough seats for five comfortable passengers. Lastly, I’d say the Fusion Energi it is quite the looker. The Chevy Volt is one of the most widely acclaimed electric cars on the market — well, one of the most widely acclaimed cars on the market period. It is the top-selling electric car in the US to date. Volt owners are known as Voltheads and were “the happiest drivers” in the US for two years running … before the Tesla Model S arrived (as per Consumer Reports owner satisfaction surveys). Check out my comparison review of the Chevy Volt, Nissan LEAF, and BMW i3. The Hyundai Sonata Plug-In Hybrid is a fairly large and classy plug-in hybrid with moderate electric range. It’s basically another competitor to the Ford Energi models and the Chevy Volt. You can see our full review of the new-in-2016 Hyundai Sonata Plug-In Hybrid here. The Hyundai IONIQ Electric is a pretty popular new electric offering from Hyundai that will also have a plug-in hybrid twin sibling and has a conventional hybrid twin sibling. The range is moderate — between initial fully electric offerings but quite far below the Chevy Bolt (aka Opel Ampera-E) and updated Renault Zoe. The IONIQ Electric seems to be selling okay in Europe. If it is widely offered in the US, it could have a good run there as well, but it really needs more range to compete with the Bolt or Tesla Model 3. The Chevy Bolt is certainly a breakout fully electric model — the first “affordable” fully electric model in the US to have long range. It arrived on the market at the very end of 2016 and is expected to see strong sales in the US, and perhaps also in Europe when it is launched there as the Opel Ampera-E if GM tries to market and sell the thing. A fully autonomous version of the Bolt will be produced as well. It will initially be tested/used by Lyft drivers. The Mitsubishi Outlander Plug-in is a hot plug-in hybrid electric SUV/crossover that has been selling very well in its home country of Japan and European markets. It was initially supposed to make it to the US market in 2013, but due to manufacturing delays, the target is now 2017 … maybe. Despite just hitting the market in the second half of 2013, the Outlander PHEV was the 5th-best-selling electric car in the world in 2013. Furthermore, it arrived in Europe at the end of the year, and it ranked #3 there, only behind the Nissan Leaf & Renault Zoe. In 2014, the Outlander PHEV was the top-selling EV in Europe. It basically competes only with the Renault Zoe for the annual sales gold medal in Europe. See my full Outlander Plug-In Hybrid review here. The BMW 225xe iPerformance Active Tourer is a popular offering from BMW in Europe. This plug-in hybrid is routinely on the European best-seller list. It has a decent 0–60 mph acceleration of 6.7, plus the luxury and handling you’d expect from a sporty BMW. I’m yet to see one in person, let alone drive one, so I’ll have to wait until I get my hands on one to provide a more complete summary or review. The Volkswagen Golf GTE is a sporty plug-in electric car … that obviously comes with a price hike over VW’s other two offerings. The Golf GTE can go from 0 to 100 km/h in 4.9 seconds on electricity or 7.6 seconds on gas, and the car has 210 horsepower. The Golf GTE’s top speed is 222 km/h. The European testing system gives the Golf GTE an average fuel economy of 175 mpg (74 km/l). The Golf GTE’s engine, electric motor, and transmission are actually — despite the very different outer package — the same as in the Audi A3 e-tron. The Audi A3 e-Tron is another plug-in hybrid electric car with a bit of a sporty offering — well, as I said, it’s the same as the VW Golf GTE under the hood. The electric-only range is not spectacular, but it’s pretty much par for the course. The A3 e-Tron can go from 0 to 60 mph in a respectable 7.5 seconds. It has also landed a difficult 5 stars in Europe’s safety ratings. The A3 e-tron has a tough time competing with the Chevy Volt and Ford Energi models on value for the money, in my humble opinion, but some people clearly prefer the e-Tron’s looks and the Audi brand. As expected, the A3 e-tron is not widely available, which provides it with the “compliance car” label. You can read my review of the A3 e-tron here. The Mercedes-Benz B-Class Electric (now called the B250e) has been an extremely close competitor to the BMW i3, and was the first offering from Mercedes in the EV department. It has a Tesla drivetrain at its core, and reviewers have been split between it and the BMW i3, with some preferring the i3 and some preferring the B-Class Electric. One of our top EV reporters has the B-Class Electric and reviewed it after 1 month, after 1 year and sort of again after 2 years. Mercedes has always treated this like a compliance car and not many have been sold, but I imagine sales will drop even further with the Bolt now for sale, the i3 getting longer range, and the Tesla Model 3 coming soon. The BMW i3 is BMW’s first 100% electric car built electric from the ground up — and it’s still one of the only electric cars on the market built electric from the ground up. It is part of BMW’s “born electric” i series and its price puts it somewhat in the middle of the more popular Nissan Leaf and Tesla Model S. Despite looking a bit bulky, the BMW i3 is the lightest electric car on the market thanks to its carbon fiber body. It’s super fun drive — one of my favorites. Compared to BMW’s overall sales, the i3 is selling pretty well, making it clear that BMW is one of the auto-manufacturing pioneers in the electric vehicle space. Read my first BMW i3 review here and/or my second review & comparison with the LEAF & Volt here and/or my comparison with the Tesla Model S here. The Chrysler Pacifica Hybrid is the first plug-in hybrid — and first hybrid — minivan on the market. It is quite attractively priced for the minivan market and could be a huge hit. It’s strange that Fiat-Chrysler Automotive — whose CEO hates EVs — went and produced what could be one of the most competitive EVs on the market. Well, that’s if Chrysler really opens it up beyond a few compliance car regions. The BMW 330e is another fairly expensive offering from BMW. This one, though, is a plug-in hybrid rather than a fully electric car. It has exciting acceleration at 5.9 seconds to 60 mph, and I’m sure it includes the luxury and handling you’d expect from a typical BMW of this price. We are yet to get behind the wheel of a 330e, though, so stay tuned for a review once we do. Although, given that the electric range is pitiful, I’m not sure if I have enough interest to ever get behind the wheel anyway. The Volkswagen Passat GTE is a very popular plug-in hybrid on the European market. Apparently, the mixture of class, space, performance, and electric driving pleasure are a good match for a large number of buyers. However, with minimal electric range and a sizable price boost, I’d say it just another compliance car from Mercedes. Hopefully the respected German auto giant moves beyond this compliance phase quickly. The Mercedes-Benz C350e is another fairly expensive offering from Mercedes very similar to the 330e. This plug-in hybrid has the same 0–60 mph time — 5.9 seconds — a city fuel economy of 45 MPGe and a highway fuel economy of 61 MPGe. The Volvo V60 Plug-in Hybrid is a diesel hybrid that has excited many an EV journalist and blogger. It’s a sweet plug-in hybrid with class and comfort. But, really, it’s more than that. From the British brochure for the Volvo V60 PHEV: “The Volvo V60 D6 AWD Plug-in Hybrid is like nothing you’ve ever experienced. It’s the world’s first and only luxury diesel hybrid that also runs on pure electricity. It’s a car born from Volvo’s vision of a sustainable future and increasingly efficient cars. And it’s a dream realised – a pioneering, engineering revolution that gives you three different ways to drive in one extraordinary car.” The car can go from 0–60 mph in under 6 seconds. NoModel S, but not bad for a practical and luxury vehicle. Of course, it also comes with a hefty price in the European countries where it’s available. Be sure to check out the Fully Charged review of the Volvo V60 PHEV for more details. The BYD e6 electric car is on the market globally, but it is only available to fleet buyers in most places (including the US and Europe). Outside of China (where it is manufactured), it seems to be that’s the only way it’s sold. The e6 was the 2nd-best-selling electric car in China in 2013, but it has dropped a great deal since then. The Mercedes-Benz GLE550e is a pretty stunning small SUV that has a superb 0–60 mph time of 5.3 seconds. However, it is pretty lame as far as EV driving goes since it only has 12 meager miles of electric range. Together, that basically means less fuel economy (43 MPGe on electricity and 21 MPG on gas) than a Toyota Prius — which is shameful for a plug-in vehicle. The Tesla Model S is widely regarded as not just the best electric car on the market but the best mass-produced car of any type in all of history (see here, here, here, here, and here for just a few examples). So, for many people, if they can afford a $60,000–$120,000 car, the Model S is as good as it gets. This car has flipped the electric car and overall auto world on its head in many respects. It is a top-selling luxury/premium-class car — well, the top-selling luxury/premium-class car in the US. It has robbed Mercedes and BMW of loyal buyers quicker than the roadrunner can dart away from a certain coyote. The Audi Q7 e-Tron is another high-end plug-in SUV. This offering from Audi offers a mix of luxury, performance (0–60 mph in 5.9 seconds), and electric driving pleasure — perhaps not best in any one of those but a decent compromise with the Audi packaging that many people love. I can’t imagine choosing this over a Tesla Model X, but I guess some do prefer it. Tesla’s 3rd model is the ridiculously cool and highly desired Model X, an SUV with similar performance and specs as the Model S. In fact, despite being a large SUV, the Model X is one of the quickest production cars in history. It’s not quite as quick as the Model S, but it’s definitely more comfy and luxurious, imho. As Elon Musk has said, the choice between the Model X and Model S is really just whether or not you want an SUV/crossover or a sedan. The Model X is special for combining excellent performance, great utility, and hot styling. Not many vehicles can do that. Its signature feature? Its falcon-wing doors, of course — love ’em or hate ’em. I honestly think this is the best passenger vehicle on the planet, but YMMV. 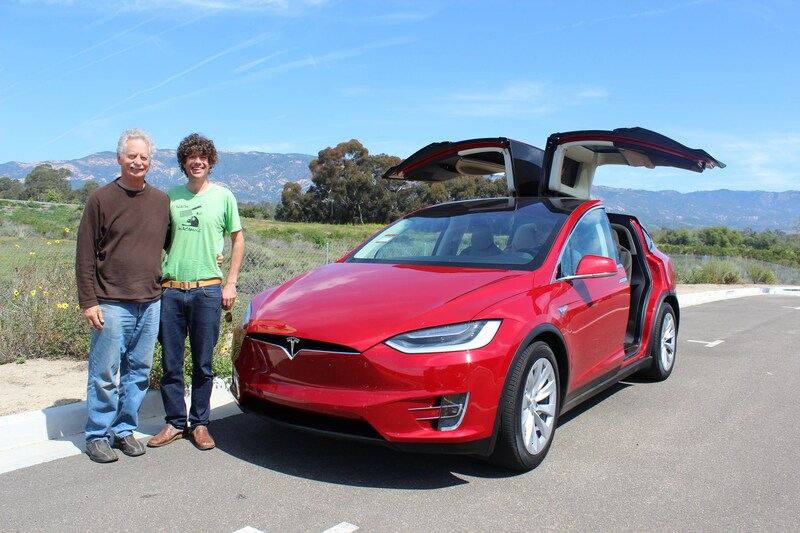 You can read my review of the Model X here and Kyle Field’s review of the Model X here. Following the successful Porsche Panamera S E-Hybrid (see below), Porsche launched the Cayenne S E-Hybrid at the end of 2014. The Porsche Cayenne S E-Hybrid can go from 0 to 60 mph in just 5.4 seconds, and has a top speed of 151 mph. I think “wicked” is the word for that. The plug-in model sells quite well relative to the normal Cayenne, but that doesn’t compare to Model X sales. The BMW 740e is another high-end (super high-end) offering from BMW. This plug-in hybrid again comes across as a compliance offering, but it does has an exciting acceleration to 60 mph in ~5 seconds and more luxury than a prince needs. Of course, the price tells you as much, and it’s hard to understand choosing this model over a Tesla, from my perspective. The Porsche Panamera S E-Hybrid is a plug-in hybrid electric sports car that is everything you’d expect — awesome. It can go from 0 to 60 miles per hour in ~5 seconds. The Panamera S E-Hybrid sometimes accounts for nearly 10% of all Panamera sales. It’s a ton of fun to drive, but still a bit hard to justify for the price compared to other high-performance EVs on the market. The place where it has them beat, though, is in luxury (imho). You can read my review of the Panamera S E-Hybrid here and my comparison of the Porsche Panamera S E-Hybrid, Tesla Model S 70D, Tesla Model S P85D, BMW i8, BMW i3, and Cadillac ELR here. Oh, what was that — the above prices weren’t high enough for you? Well, I’m yet to set foot in a Mercedes-Benz S550e, but I’m guessing it has a bit of luxury and snaz as well … because the price is way up there. Despite being a luxury sedan, the S550e still has great acceleration, getting to 60 mph in 5.2 seconds. We haven’t yet reviewed this model, so I think Mercedes should drop one off at more doorstep sometime. The BMW i8 is BMW’s second i-series car. It’s one of the most expensive cars on the market — actually, the most expensive on the mass market today. It comes with a ton of style and great acceleration (0 to 60 mph in 4.4 seconds only trails the Tesla Model S P85D’s 3.2 seconds amongst electric cars). It’s hard not to covet this beauty. While it has amazing power and is a lot of fun to drive, it is again hard to justify such a high price with other high-performance cars like the Model S much cheaper, but if you’re chasing style, this may well be top dog. You can read my review of the BMW i8 here and my comparison of the BMW i8, BMW i3, Porsche Panamera S E-Hybrid, Tesla Model S 70D, Tesla Model S P85D, and Cadillac ELR here. I don’t know if this one counts, so it’s not counted in the “20” in the title. The Rimac Concept_One is certainly no everyman’s car. It is an electric supercar out of Croatia that costs a fortune … as in, $1 million. Needless to say, most of us will be lucky to even see one of these, let alone touch one, let alone ride in one, let alone own one. Still, it’s a beauty worth mentioning. The Rimac Concept_One can reportedly go from 0 to 60 mph in 2.8 seconds and has a horsepower of 1,088 — yep, that’s a “supercar” … even though the top-line Model S is now quicker. Rimac Automobili is a Croatian company, and it’s unclear if it’ll ever grow up enough to produce >100 cars, but the Concept_One will go down in history either way. For monthly and yearly sales reports by country, see our Electric Car Sales page. See something missing here? Drop us a note.